PLEASE KNOW THAT NORTHLAND NATURAL PET DID NOT RECEIVE OR DISTRIBUTE THE PRODUCT AFFECTED BY THE RECALL. STORES THAT MAY BE AFFECTED HAVE BEEN NOTIFIED BY VITAL ESSENTIALS AND THEIR DISTRIBUTOR. Carnivore Meat Company is voluntarily recalling a single limited lot of Vital Essentials Frozen Chicken Patties Entrée for Dogs. The Federal Food and Drug Administration (FDA) selected and tested product as part of a national collection initiative, which was issued by the Center of Veterinary Medicine (CVM) on June 3, 2015. The FDA notified Carnivore Meat Company that one of the samples collected, tested positive for Salmonella, bacteria commonly associated with fresh and frozen poultry, in human and in pet products. There have been no customer complaints reported. No other product manufactured by Carnivore is involved in this voluntary recall. Vital Essentials Frozen Chicken Patties Entrée for Dogs, Net wt. 6 lbs. The “Best By” date code and lot # is located on the back of the package. The affected product was distributed in CA, FL, GA, RI, TX and WA. 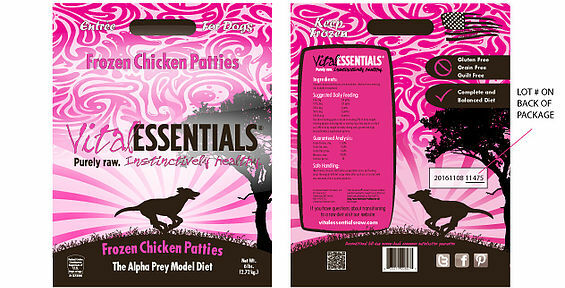 If you are a consumer and have purchased a bag of Vital Essentials Frozen Chicken Patties, net wt. 6 lbs., with the “Best By” date code of 20161108 (11/08/16) and lot # 11475, we ask that you please call 920-370-6542 Monday-Friday 9:00AM-4:00PM CST and someone will assist you in obtaining replacement or a full refund from your local retailer for your original purchase. If your package has been opened, please dispose of the raw food in a safe manner by securing it in a covered trash receptacle. Representatives are available from Monday – Friday 9:00AM – 4:00PM CST at 920-370-6542.